What is a Numerical objective? When you have an objective to maximize or minimize something that can be expressed as money, time, distance, weight, etc, we call it numerical type objective. When you have a number type attribute for a payoff, a utility function is used to map the real world value to a level of satisfaction that is expressed within a number between 0 to 100 (or 0 to 1) based on your preference. 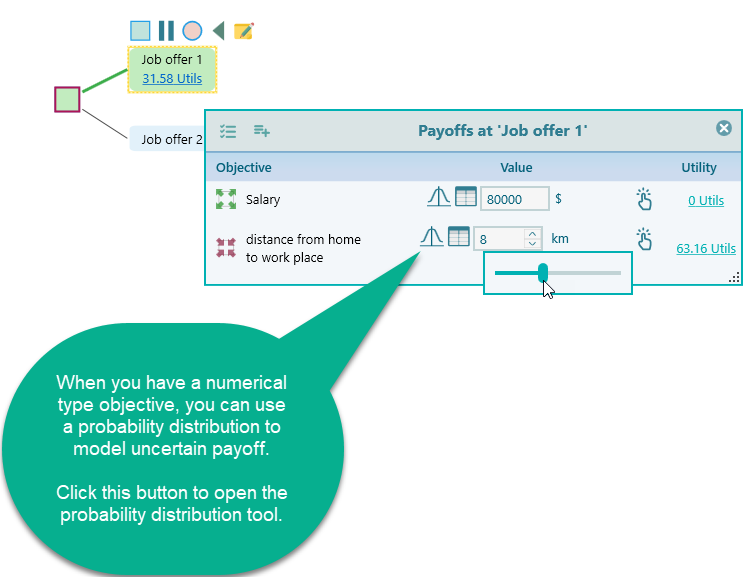 After you have created a number type objective, when you will set a payoff for a decision tree node, you will be presented with a number input box. Once you focus/click on that number box, a slider will show up to help you speed up the input process. Say you have the following 2 objectives when you look for a new job. Minimize distance from home to the workplace. 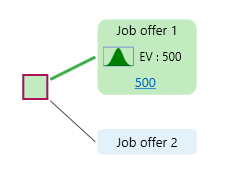 Once you model such objectives, then in the decision tree payoff window, you will see the following user interface. 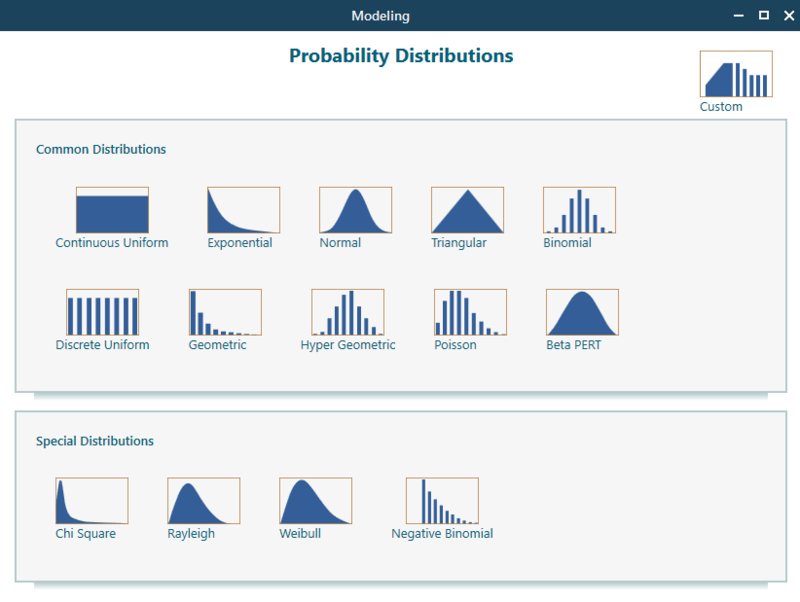 Once you click the probability distribution button, you will find the probability distribution tool shows as explain in a separate page. 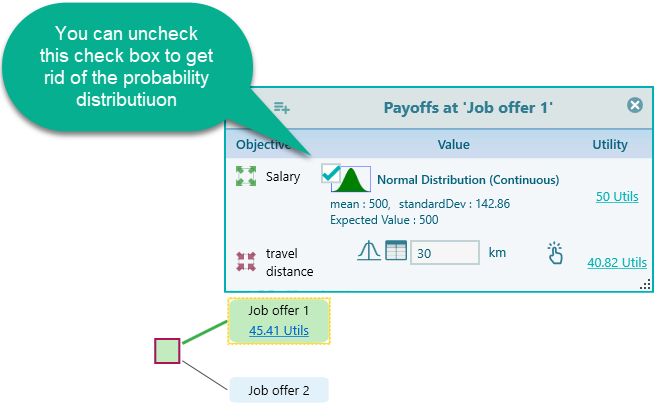 Once you select and configure a probability distribution for a numerical type objective, you will the icon in the payoff window. If you have more than one objective, then the probability icon will show up in the popup window as shown below. You may have a list of items sum up when you think about a payoff. For example, if you are thinking if you should buy a car or fix your existing car which has some problems. You may have a list of things to fix. No, you do not need to open up Excel for doing this calculation. In the payoff window, click this table icon button to open the table entry. Once you click the table entry button, you will see the table entry user interface as shown below. When the start the objective creation wizard, you will see the following screen. In order to model a numerical type objective, choose either Maximize or Minimize from the drop down as shown below. Say, you have entered the following criterion in the objective start screen as shown below. In the above screen, click the button "Numerical Type". 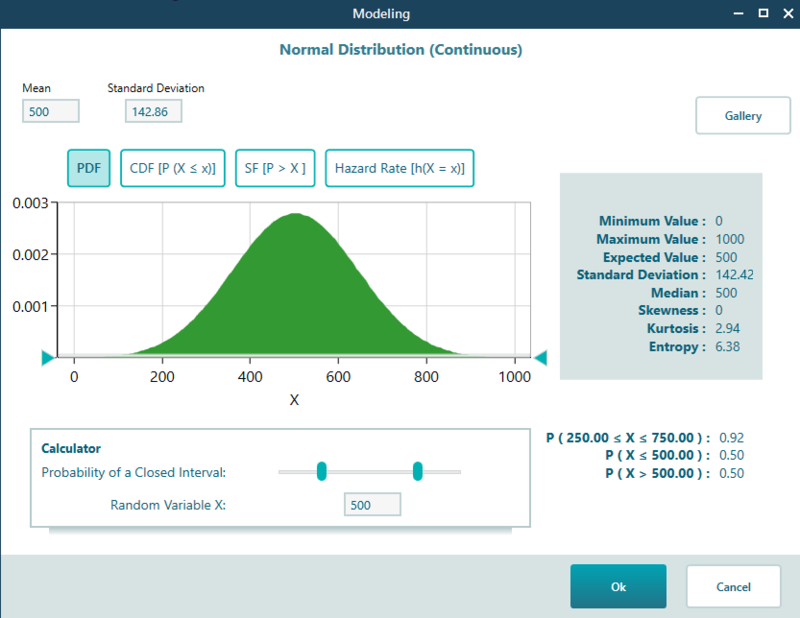 Then you will be asked to enter a unit (optional), and the minimum possible value of the criterion and the maximum possible value of the criterion. Why it is needed? Because in order to generate a utility function, a minimum value and maximum value can be useful. Also, based on the minimum and maximum value, in the payoff window, a slider can be presented to you to set a value for the payoff. We have already explained how to invoke the objective editor. Once you create a numerical type objective and open the objective editor for the numerical type, you will see the following view. You can see that you can change minimum value, maximum value, unit, and Attribute Type. You can also change the goal to Maximize or Minimize. You can change the name of the objective too. In addition, you see some new things, like Aspiration level, Satisficing, and associated utility function. Aspiration Level is a payoff value such that, when your objective is to maximize something, if you receive a payoff lower than that amount, then you consider the payoff as a disqualified or rejected. When your objective is to minimize something (i.e. minimize cost) then if a value is over that aspiration level, then the value will be considered as disqualified. What is the use of aspiration level in this Decision Tree Software? There are many risk metrics that are calculated based on a threshold value such that you won't consider the payoff as a success. For example, Baumol's risk measure, Roy's safety first rule, etc. Satisficing value is a level of payoff such that, when your objective is to maximize something, if you receive a payoff equal or higher than that amount, then you will consider the payoff as fully satisfactory. If a payoff meets satisficing value, then you won't need to consider another option just because that another option has a higher payoff for that specific criterion. About the Utility function, please check the dedicated page for the utility function to learn more.